Study after study has proven that downtime has real benefits, and while the majority of Americans believe strongly in the value of time off, we continue to leave unused vacation days on the table. Here at Visit Hendricks County we get to help guests plan a trip to our area, but we all love to travel. I’ve made it a priority to use my vacation days, and everyone that works here is required to take their days off as well. Time off makes us better ambassadors for our community because we are happier people when we come to work. More than half (55%) of American workers aren’t using our hard-earned vacation time, resulting in a stockpile of 658 million unused vacation days and a workforce always on the brink of burn out. There is a secret to overcoming all our vacation fears: planning. Planning is the most important step in making vacation possible and, according to Project: Time Off, planners are more likely to use all their earned time off and take longer breaks at once. They are also happier with their personal and professional lives — not to mention they have bosses who have plenty of advanced notice to cover them while they’re out. Add your vacation plans to the calendar and share with your manager, your colleagues — everyone! We’ll even help you get started. Of course, we would love to have you visit Hendricks County and you can start planning your Spring Break trip today. 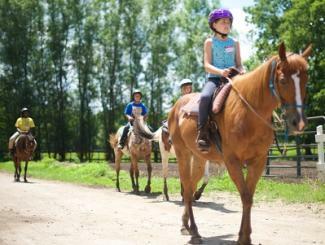 Summer is just around the corner and you can come see us and enjoy horseback riding, a relaxing ride around the lazy river and roam our small towns along the Rural Routes to Main Street Cultural Trail. Our end of summer blow out happens Labor Day weekend with the return of the 63rd Annual Chevrolet Performance NHRA U.S. Nationals at Lucas Oil Raceway – the top bucket-list race for every NHRA fan. Indiana is home to dozens of unique and interesting destinations just waiting to be discovered. You can view places across our state at Visit Indiana&apos;s website. I spent many summers at Spring Mill State Park as a kid and visited Brown County in the fall for shopping and leaf-looking every year. I’ve never missed a trip to Vevay either – a visit to Belterra Casino Resort is our own little luxury right here in Indiana. We make several long weekend visits when we can throughout the year. I can tell you in my office right now there are dozens of week-long vacations being planned for 2017 – New York City, Hawaii, Gatlinburg, a Caribbean cruise, Destin, Panama City Beach, Los Angeles (x2!) and of course my favorite, Walt Disney World. Stop dreaming of your getaway and make it a priority today, on National Plan for Vacation Day. Share your plans with us by tagging #PlanForVacation and if you are headed our way, tag #inhendricks. See you soon right here or on the road!